A gunman has opened fire on students at a university near Chicago in the United States, killing six people. 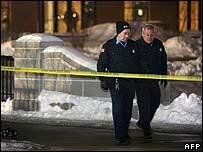 The shooting took place at Northern Illinois University, in De Kalb, 65 miles (100km) west of Chicago. Students ran for cover as a white male armed with two handguns and a shotgun opened fire during a science lecture. He then turned the gun on himself. Another 15 people were injured in the attack. Police said there was no apparent motive. Two weapons have been recovered and police are searching for a third firearm in Cole Hall near the King Commons, a central gathering place for the 25,000 students on campus. Five of the victims, four women and a man, were killed in a "brief, rapid-fire assault", university president John Peters said. A sixth student died later in hospital, the local coroner's office said. The university said that the gunman was a former graduate student in sociology, but was not currently enrolled. Earlier reports said 17 victims had been transported to Kishwaukee Community Hospital. The shooting comes 10 months after 32 students and staff were shot by a student at Virginia Tech University in one of the worst shootings ever at a US school. It is also the fourth shooting at a US education establishment within a week. Last Friday, a woman shot dead two fellow students before killing herself at Louisiana Technical College in Baton Rouge. In Memphis, Tennessee, a 17-year-old is accused of shooting and critically wounding a student on Monday, and a 15-year-old was shot at a junior high school in California on Tuesday. Students described a panicked rush from the lecture theatre as the black-clad gunman walked onto the stage and opened fire. "I kept thinking, 'Oh God, he's going to shoot me. Oh God, I'm dead. I'm dead. 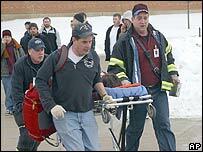 I'm dead'," Desiree Smith, a student who dropped to the floor near the back of the auditorium, told AP news agency. A student named Sheila told local radio station WBBM the gunman was quiet as he turned his weapons on the students. "He just stood on the stage in front of everybody and just started shooting," she said. "I saw a lot of blood. I have blood all over my clothes." George Gaynor, a senior geography student, told the student newspaper that the gunman was "a skinny white guy with a stocking cap on". "Some girl got hit in the eye, a guy got hit in the leg," he said. Students warned each other by mobile phone within minutes of the shootings, and the university's website issued alerts, warning of the possibility of a gunman on campus. "Get to a safe area and take precautions until given the all clear," it warned students. The site then carried updates confirming the shooting and telling students to stay away or stay in doors. It then said the gunman was "no longer a threat". Emergency hotlines and counselling are being offered for students and parents. Mr Peters urged students to remain calm and support each other. "We've asked them to reach out to each other during this difficult time, and they've done that, and I'm proud of them," he said. My girlfriend's sister is studying at NIU. Where all waiting on her to call and get in touch. We're shocked and waiting tentatively. I graduated from Northern in 1986 and am shocked to hear about the shooting. I have very fond memories of the place and could never have thought such a horrific incident could take place at such a peaceful town as DeKalb. How many more people are going to die before America does something about guns. I am an alumna of this university. Our prayers go out to the entire NIU community. Wow, very bad news. Hope no one has lost their life. I have visited that campus a few times - my previous father-in-law did a history degree there, and I spent some time there looking at doing a post-doc there. It's a very quiet campus - many students go home to Chicago at weekends, so it can be pretty dead there. There's a good law school at NIU, but students find it hard to do internships in the immediate local area. 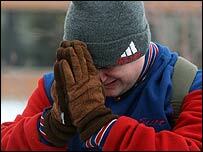 School shut down till Monday, tomorrow stress and counsellors will be available. After the alert many teachers locked students into the rooms till the all clear was given.